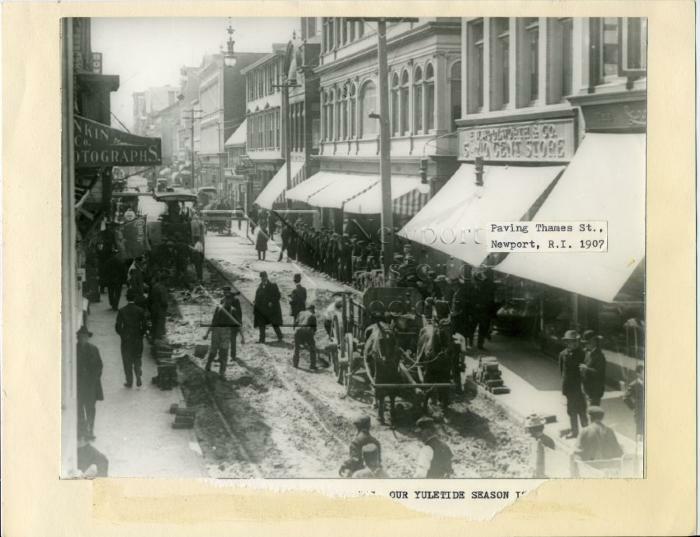 A black and white photograph depicting the paving of Thames Street in 1907. The Thames Street streetscape is clearly visible, with businesses such as F.W. Woolworth and Co., a photographer's studio, and a ship supply store. Carriages can be seen lining the street, even in the background behind a wooden barrier. A large group of people can be seen observing from the sidewalk at right. Workers can bes seen approaching the sidewalk where bricks or cobblestones are stacked.